French toast is most usually served as a sweet option, by dusting icing sugar on it and adding fresh strawberries. But there are lots of savory toppings for French toast that make this dish perfect even for a weeknight dinner. 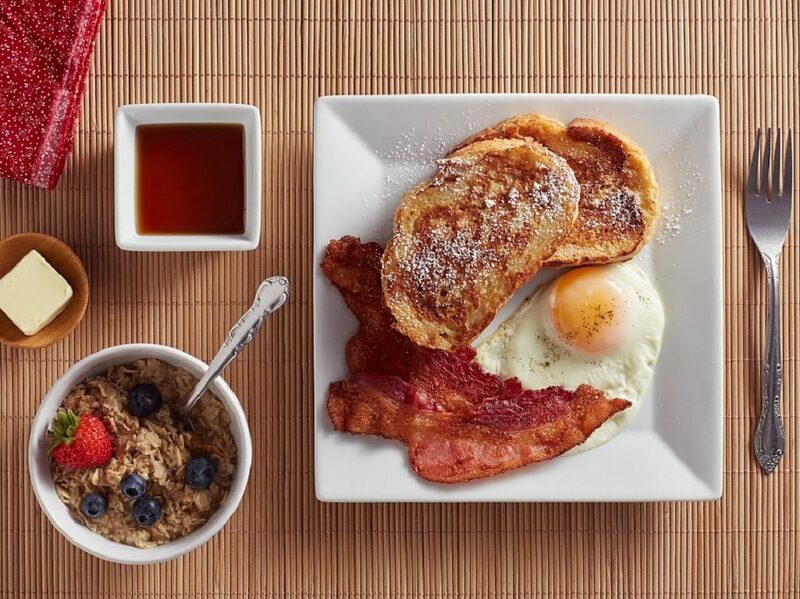 French toast – called pain perdu in French – is a classic breakfast most people usually serve with a sweet topping, like jam, maple syrup, honey, or a combo of cream cheese and fresh fruit. 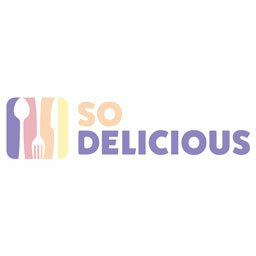 But since I’m a ‘savory & salty breakfast person’, I’ve tried to find alternatives to all the sweet things you can put on top of French toast. I’ve found out that it actually lends itself really well to savory flavors. Just give me a coffee and some French toast topped with any of the ingredients below every morning, and I’m a happy person, ready to start the day with a huge smile on my face. 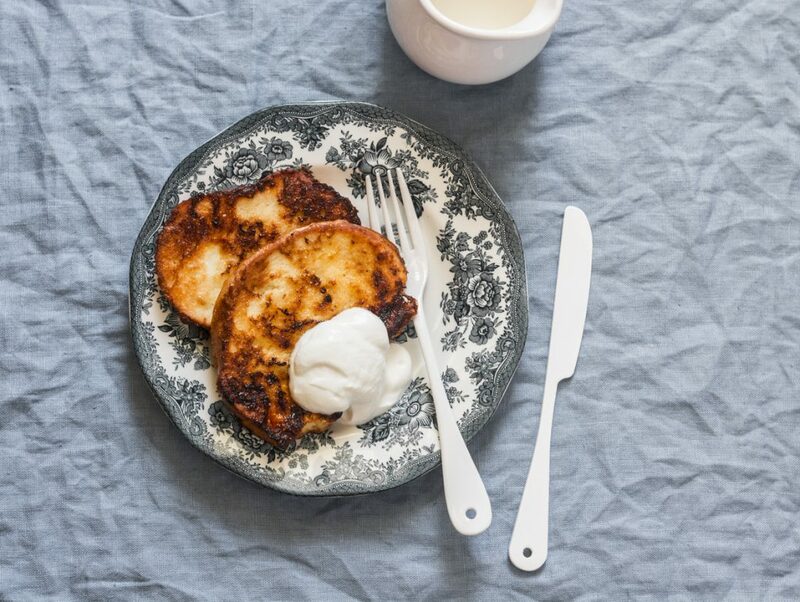 But first, you should learn how to make French toast, and here we share our recipe with you. Then, we’ll give you a great list of savory toppings for French toast. If you want to alternate between the sweet breakfasts with something salty, you should try a few savory toppings for French toast. They’re also a good idea for an evening you don’t have time to prepare a more complicated dinner. In fact, French toast doesn’t need any extravagant toppings to be tasty. Salt and pepper on their own, added to the whisked eggs, are usually enough to make a tasty and nourishing dish. But try to add chopped green onion and cilantro into the eggs before frying the toast. When ready, you can serve the French toast with sriracha sauce. 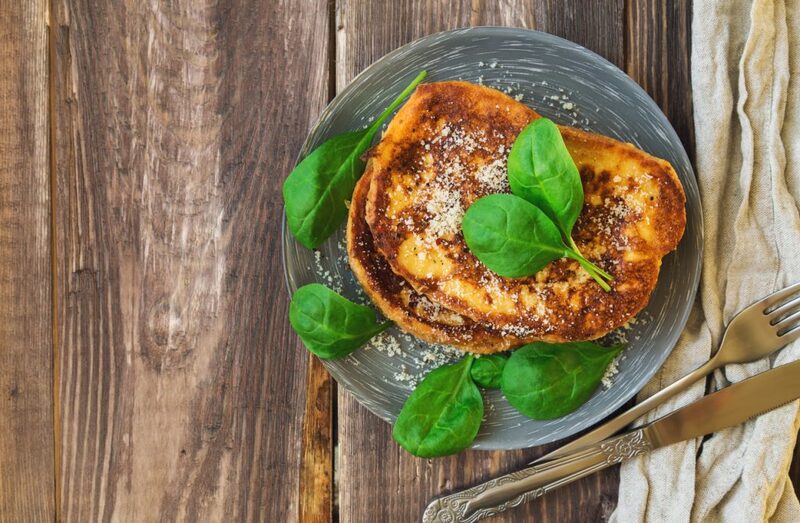 French toast with salt, pepper, grated parmesan and baby spinach. Herbed butter is compound butter made with herbs. Try rosemary, basil, thyme, sage, tarragon, dill, parsley, cilantro, or marjoram, but make sure you choose fresh herbs, because they have a strong flavor that melts into the butter. Herbed butters are great savory toppings, but you can also enrich them with other ingredients. For example, you can mix unsalted butter with finely chopped sundried tomatoes, fresh basil, and fresh or powdered garlic. Mix all ingredients together until combined, then spread the butter on the French toast. We think French toast is one of the first recipes a child can make on their own. Also, it tastes like childhood. Make this French toast with plenty of mixed seeds, sumac, and grated parmesan anytime you want to remember how it was like to be a kid. You can fry the bacon in a skillet or bake it in the oven, your choice. After you fry the French toast, add some cherry tomatoes to the same skillet and roast them so that they char and soften a little. Serve them all together. In my opinion, cheese makes anything it touches so much better. When I think of savory toppings for French toast, the first thing that comes to my mind is cheese, because I love it! You can choose feta cheese, parmesan, mozzarella or any other cheese. For example, mix mustard powder, garlic and a bit of hot sauce into the beaten eggs, then coat the toast with this mixture and grated parmesan. Make this incredibly simple dish for breakfast, brunch, or dinner. A quicker cheese version is to make classic French toast and just sprinkle crumbled feta cheese and fresh thyme on it, or just yogurt. Done! First, make a parmesan crust for your French toast. To do that, sprinkle grated parmesan on the bread slices coated in egg mixture, then fry them. The salty French toast is perfectly balanced if you serve it with really ripe sliced avocado and green onion. You could also sprinkle some salt and chili powder on them, for a little bonus savory flavor! This recipe is a little more complicated, but it’s worth your effort! It looks like a sandwich but it is French toast with mozzarella and baby spinach in the middle. If you like melted cheese, this one is for you! In the fall season, you can find different types of mushrooms. Choose your favorite one, cook them and serve them as a savory topping for French toast. All you have to do is heat oil in a non-stick frying pan over medium heat, then cook together garlic, mushrooms and tomatoes for 5 minutes or until the mushrooms have softened. Serve them warm on French toast. Want some sour cream? Add some! Yes, we know French toast already has eggs. But that won’t be enough for an egg lover! French toast is great if you top it with sunny-side-up eggs! Sprinkle sea salt, freshly ground pepper, and chopped green onion! That’s perfection! If you want your French toast to be spectacular for a late brunch, spread it with cream cheese and top it with smoked salmon! You can add avocado, red onion slices, and a baby spinach or arugula salad on the side, and you’ll see how beautiful a day can begin! Especially if you do this during the weekend!